Being well-informed about and responsive to your customers is the only way to come up with appropriate solutions. Inclusive fintech CEOs work in the most highly-regulated sector on earth. They have to hire talented teams, navigate opaque regulations, and work hard for funding. In addition to entrepreneurial challenges, they’re also trying to create impactful businesses that help build a financially inclusive world. That doesn’t overwhelm the founder-CEOs that we work with. 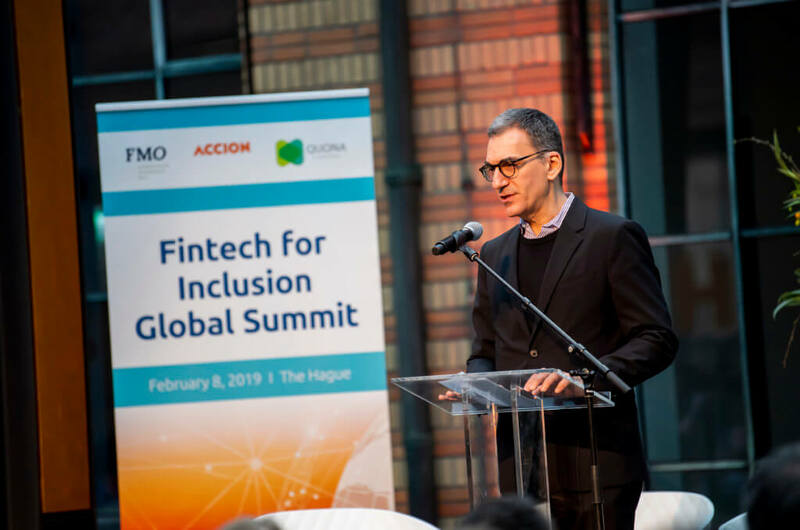 Being in a room with roughly 50 of the most innovative fintech CEOs and company leaders at the Inclusive Fintech CEO Forum in The Hague was absolutely thrilling: they’re all working on a common mission and trying to bring new financial tools to people who need them. At the Inclusive Fintech Summit, leaders came together to discuss how we can drive financial inclusion. 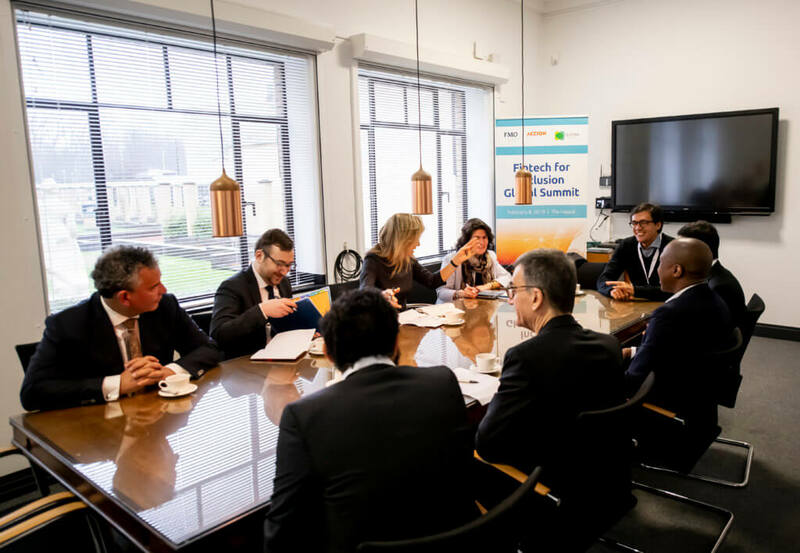 Hosted by Accion Venture Lab, Quona Capital, and FMO, the Forum allowed CEOs to learn from one another: whatever a CEO’s top problem was, someone else there had solved it, thought about it, or, at the least, could commiserate about it. More often than not, their conversations returned to basic issues like hiring staff, creating an effective corporate culture, overcoming adversity, or engaging customers. These issues are more important today than ever before: by understanding peoples’ behavior, needs, and goals, we can use technology to provide more customers with better, faster, cheaper, and safer financial products and services. Knowing our customers is the only way to develop a scalable, sustainable, and impactful company — and building those companies is how we’ll create a financially inclusive world. Technology is not the product. Instead, it’s a background layer that should enable product delivery. For financially underserved customers, the technology tends to work best when it automates internal operations in the background — not when it’s foregrounded as the product itself. Don’t assume. Talk to prospective clients first. What technology do they use? How do they use it? What are they willing to try? Shrink your time zones. Have your tech team near your customers so they can respond quickly. Create a feedback loop where both your tech team and customers inform one another. The more your team knows your clients, the better. Make sure your entire team knows who your customers are. Arrange client visits or allow back-office staff to join customer calls. Hiring is the only challenge that gets more difficult with time: as roles become more complex and as an organization takes on more work, hiring the right candidates becomes harder and inhibits companies’ ability to scale. Always be recruiting. Extend your talent pipeline as far as it can go, because even if the seats aren’t open today, they will be soon. Treat recruiters as business partners. Ultimately, you’re both working to build a better organization. Value the right attitude and generalists over specialists. Specific skill requirements can change over time, so it’s better to get someone who can adapt to multiple future needs. And attitude should count as much as skills: Harvard Business School found that avoiding toxic employees is worth twice as much as the returns that top workers produce. Toxic workers also diminish productivity and drive out other employees. CEOs’ actions and choices have an outsized role in creating corporate culture. High-performing organizations have great corporate culture: it gives them a competitive advantage. Explain what you believe. Every organization should explain its values in concise, memorable language. Those values should factor into hiring new employees or evaluating current employees. Cultivate psychological safety. The feeling that a team “is safe for risk-taking” was the biggest contributor in Google’s review of successful team dynamics. Psychologically safe teams brought in more revenue and were twice as effective as ‘unsafe’ teams. Develop employee value propositions. These identify why a prospective employee should work for a given startup. They elevate the organization’s mission and explain how an employee could grow from their work at a particular company. One session on overcoming adversity resonated with many in the room. Founder-CEOs routinely face any number of crises; professionally, there’s nothing harder than trying to lead your team through a major challenge. Keep the right people with you. Rely on the team you trust to help turn the ship around. Promote them if that’s what it takes to retain them. If bad news is coming, you want to be the one sharing it. Don’t let someone else tell your story. This is true for your investors, employees, and family. It’s important to be honest and transparent. In good times — and especially in bad times — let people know what’s really happening. That said, you don’t need to bring everyone through every twist and turn. Focus on the most important issues and communicate them well. Protect your health. Founders emphasized basic self-care, including exercise, sleep, cutting alcohol and sugar, and seeking advice from mentors. By focusing on our users and understanding their needs, behaviors, and goals, we’re more likely to create valuable financial products and services. And by building teams that know their end-clients, founder-CEOs can create impactful and successful companies. That’s easier said than done. But after meeting and speaking with so many extraordinary people who are all working so hard to pursue a common vision and change the world, I’m more optimistic than ever about our chances. Many thanks to CGAP, Catalyst Fund, Triodos, Citi Inclusive Finance, Mastercard Foundation, and Community Investment Management for helping to convene the Inclusive Fintech CEO Forum.